Cardinals catcher Yadier Molina caught a foul tip in unorthodox fashion when a batted ball came to rest between his right thigh and torso as HP Umpire Chris Segal declared the play a legal catch and strikeout, explaining to Padres Manager Andy Green why the odd rebound resulted in strike three. 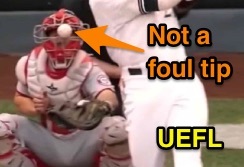 Video: A foul tip vs a foul or lodged ball. This play highlights the importance of knowing Official Baseball Rule 5.09(a)(2) as well as the Definition of Terms regarding a foul tip and catch. Not only is the batter's status as a strikeout victim (if a foul tip) or being able to continue the at-bat (if a foul ball) in question, if there were runners on base, stolen bases or other advancement could come into question (if a foul tip, the ball is live and any steals would be valid; if a foul ball, the ball is dead and any steals would not count). The Play: With two strikes, the batter swings at the pitched ball, his bat making contact with the ball and sending it sharply and directly toward the catcher, whose hand/glove/mitt either (A) does, or (B) does not, touch the ball, after which it comes to rest trapped between the catcher's thigh and torso. The catcher slowly stands up and retrieves the ball with his bare hand; the ball never touches the ground. Is this a foul tip or a foul ball? Answer: In (A), it is a foul tip and results in the third strike on the batter; the batter is out and the ball remains live, meaning any stolen bases or other runner movement would stand. In (B), it is a foul ball; the batter remains at bat and the ball is dead, nullifying any stolen bases or other runner advancement. Related Post: An Unconventional Foul Tip in the Big Apple (4/10/17). This is an example of a foul ball. The Definition of Terms resembles Rule 5.09(a)(2) Comment, and states that, "A FOUL TIP is a batted ball that goes sharp and direct from the bat to the catcher’s hands and is legally caught." 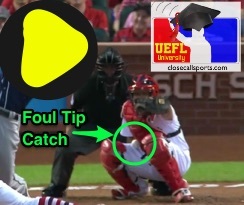 For instance, the accompanying image of a batted ball that strikes the catcher's mask immediately after it is hit by the bat would be an example of a foul ball. Though this particular play ended up as a lodged ball (the ball was stuck in the mask), had the ball fallen out of the mask and into the catcher's hand, it would still be deemed a foul ball. Recall that a catch "is the act of a fielder in getting secure possession in his hand or glove of a ball in flight and firmly holding it." A fielder may smother the ball against his body and complete the catch simply by holding the ball in his hand or glove, but the fielder may not use a cap, chest protector, mask, pocket, or other item not natural to the fielder's person in order to complete the catch. It is similarly not a legal catch if at any time prior to secure possession the batted ball touches the ground, an umpire, or an opponent (it may touch a teammate).